Chinese people have enjoyed popcorn for many generations. 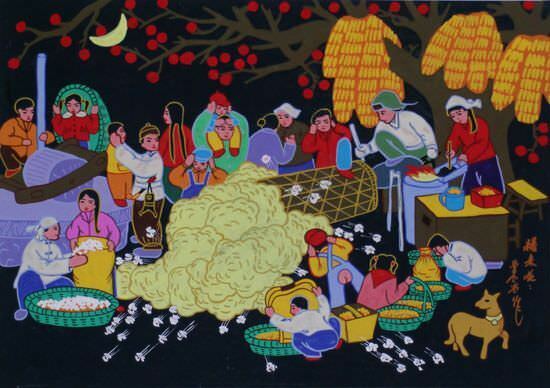 This painting is of a typical scene in a Chinese village. A large drum is spun over a hot fire. The pressure builds inside as the popcorn pops. When it is finally opened and the pressure is release, a huge boom is heard. Everyone in the village knows when the popcorn is ready to eat when they hear that unique sound like a sonic boom when the popcorn explodes out of the drum. The actual Chinese title is "Bao Mi Hua" which means "Exploding Popcorn".